The tenacious woodcutter. There was once a lumberjack who showed up to work in a lumberyard. The salary was good and the working conditions even better, so the lumberjack set out to make a good paper. 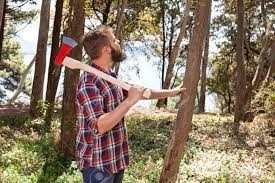 The first day he presented himself to the foreman, who gave him an ax and assigned him an area of ​​the forest. The excited man went out to the woods to chop. In one day he cut eighteen trees. "I congratulate you," the foreman told him. Keep it up. Encouraged by the words of the foreman, the woodcutter decided to improve his own work the next day. So that night he went to bed early. The next morning, he got up before anyone else and went to the forest. Despite all his efforts, he could not cut more than fifteen trees. -I must be tired, he thought. And he decided to go to bed with the sunset. -When did you sharpen your ax for the last time? -Affiliate, I have not had time to sharpen. I've been too busy cutting down trees.